With the addition of the Plate-Mate Tray Support Set (Model DBS-910) to your original, standard 84 plate cart unit (PM84-120), you get dual use out of a single plate trolley! Holds up to 700 pounds! 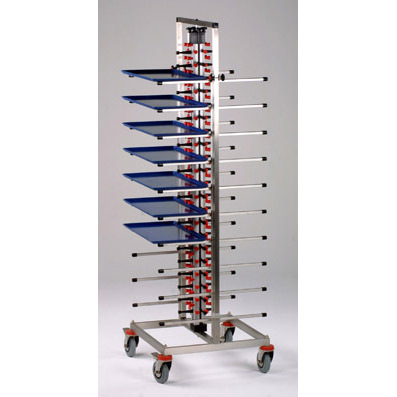 By using the PM84-120 plate cart together with a DBS-910 20 tray support rack, you are able to stack and transport up to 20 large serving trays. The 20 tray rack can be either oval or rectangular but must have a minimum width of 21 inches or 55 cm. With this option it is possible to use the PM84-120 trolley for cleaning tables or create extra storage near the dishwasher. The 84 plate trolley with our 20 tray DBS-910 tray stack can be used for clearing tables or to create extra storage for plates, bowls and cups. 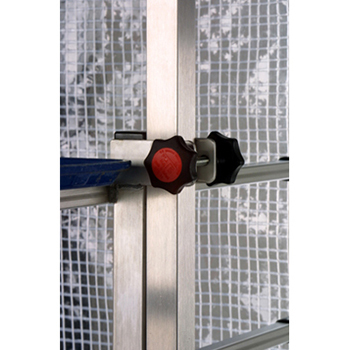 Our Tray Support can be added to the Standard PM84-120 Plate-Mate. After your PM84-120 cart is fully assembled, be sure to properly align your tray support accessory by fitting the bottom of the tray support into the matching holes in the bottom of the PM84-120 base. This will properly align the rest of the unit. Remove the nut from the screw at the bottom of each DBS support tray rack. You may want to refer to the cut sheet that came with your tray support unit. 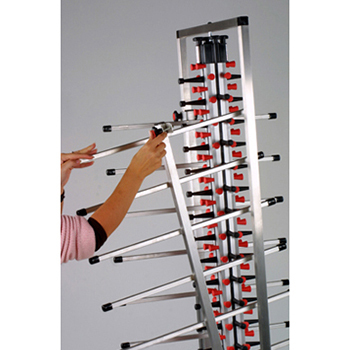 Turn the screw at the bottom of each DBS support tray rack until the screw protrudes 1 3/4 inches. Put the nut back onto the extended screw (midway)- support arms. The nut will rest on top of the hole. Slide the Tray Support snugly against the upright frame of the PM84-120 (Standard unit) one side at a time, lining up brackets with frame. Make sure that the sides of the column (with the red shuttles that are almost touching the top of the column) are facing the end-user/you. Keeping the bottom peg lined up in the hole (see Step #1) slide the Tray Support into place on the PM84-120 frame. 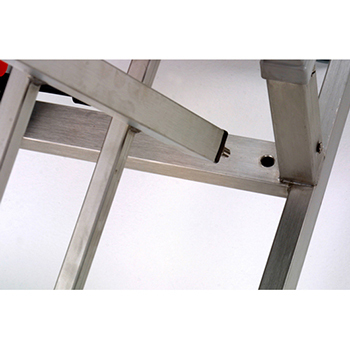 As a final step, bolt the top of the DBS tray support racks tot he PM84-120 frame. make sure both sides are securely bolted in place. 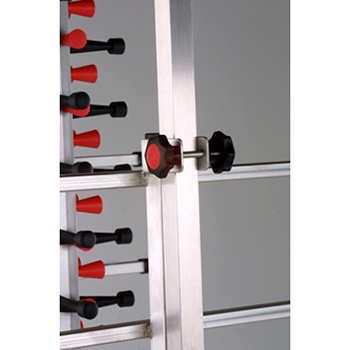 This securely attaches the Tray Support to your PM84-120 Plate Rack in 2 different locations. This image demonstrates a proper firm fit. The tray support should be firmly aligned with the PM84-120 frame. You can now add up to 20 serving trays to your Standard Plate-Mate, increasing your load limit to 700 lbs.